kneeling on one knee (with the other foot flat on the ground). All of these need at least a thick carpet, and preferably a thick cushion, such as one off the base of an armchair, to protect your knees. If your body is not used to spending a long time in this position, build up the time spent kneeling slowly. You may then find that you can comfortably spend an hour kneeling by switching between the positions. You can kneel on a cushion on the floor to type at a low desk. 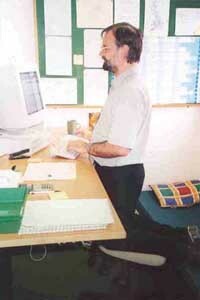 To use a normal desk, you need to kneel on some sort of raised platform to get to the right height. In the picture I (Jon) am kneeling on an office chair which has had its back removed. 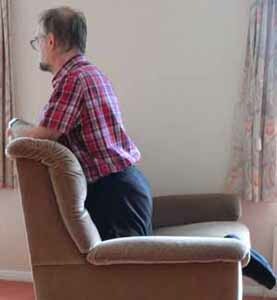 Kneeling on a padded armchair or sofa turned backwards gives you somewhere to lean, and allows you to watch TV, read, etc, while avoiding all pressure on the coccyx. Try different chairs to find one that suits you.